Art is no stranger to masculine bravado -- Picasso was legendary for his torrid affairs, and hey, how about that guy who painted Fabio? Mmm...muscles. Pushing the boundaries of the Penism movement, Jason Chalker's "Manly Art". Naughty Betty, Peeping Fred: Betty smokes a cigarette on her knees on some sort of woolly mammoth-fur rug, wearing a Paleo-riffic bikini as Fred's eyes practically pop through the window -- clearly, the only Barney he'll share this with is his own purple dinosaur. 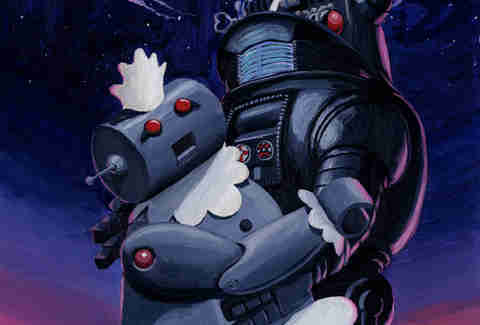 Forbidden Love: This Casablanca-esque scene depicts Robbie the Robot embracing the Jetsons' housekeeper Rosie, no doubt pretending to care about how angry she gets when George and Jane call her a "maid" instead of a "cleaning droid". Snoopy vs. 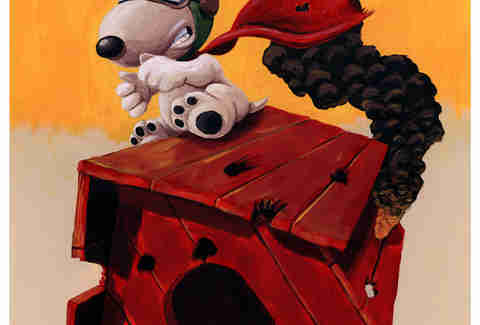 The Red Baron: Snoopy engages as smoke billows out the back of his doghouse -- a sweet painting, though the absence of Woodstock is disturbing, since everyone knows you never, never leave your wingman. Chalker's original works start at $200, or you can get prints for $10 and up; there're also tees, though if you think sporting John Belushi's character from 1941 on your chest is going to cause women to want to rip off your shirt and expose your Fabio-like bare chest, you're in for a long Blue Period.